What a milestone! This is every single profile from Fire Emblem 6 (Sword of Seals) translated on this website. I did some out of order before, so their format is slightly different. But this is every single character in the FE6 Character Book. It is only actually half the book, as the next half is Fire Emblem 7: Blazing Sword (first one in the US). I used the names that were on the pages, even if they had official localized names in FE7, with a few exceptions. However, from now on (into FE7), I will try my best to use their localized names. 56 K Warning for a lot of images ahead! All of these scans are from serenesforest.net, and have been edited/translated by me. Their original transcripts are found on their original pages. 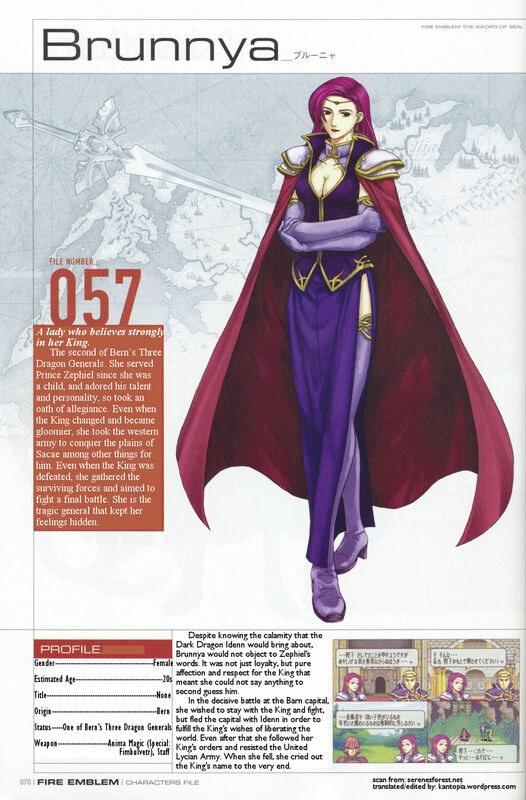 Today I translated and edited Brunnya (Fire Emblem: Sword of Seals)’s art book page (070). Japanese and English transcripts can be found below the picture! As well as the original image. This scan was from serenesforest.net.